Image credit: State Street Global Advisors. The four-foot bronze “Fearless Girl” statue was removed from her spot across from the iconic “Charging Bull” in Bowling Green Tuesday night, AMNew York reports, and is on her way to a more pedestrian friendly spot in front of the New York Stock Exchange. Since its appearance in 2017 a day before International Women’s Day, sending a message to Wall Street for the need of gender equality in the financial world, the diminuitive statue has become a major attraction, drawing millions of tourists and locals. State Street Global Advisors, the investment company that owns the statue, said she’d be installed in her new home by December 31. 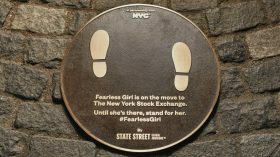 Mayor Bill De Blasio announced today that the “Fearless Girl” statue currently staring down the iconic Wall Street “Charging Bull” will be getting a permanent home in front of the New York Stock Exchange in the Financial District. 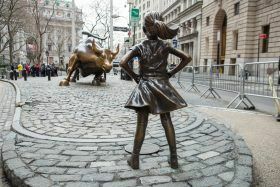 Since the diminutive statue’s temporary installation more than a year ago a day before International Women’s Day, sending a message to Wall Street for the need of gender equality in the financial world, the statue has become a major attraction, drawing millions of tourists and locals. The statues available for sale. Photo Credit: Jafe Parsons. It was bound to happen. Two-foot-high replicas of the popular, controversial “Fearless Girl” statue of a young girl standing up to Wall Street’s “Charging Bull” are now for sale, Huffington Post reports. The statue’s creator, artist Kristen Visbal, is selling reproductions of the infamous statue for $6,500; the statues will be part of a limited edition with only 1,000 made in total. The creator of the iconic Wall Street “Charging Bull” is snorting mad over the appearance of the bull’s new companion, artist Kristen Visbal’s bronze “Fearless Girl” statue. 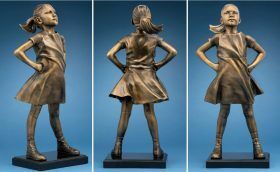 76-year-old Arturo di Modica, the artist who made the iconic sculpture that, like its young challenger, was installed in the wee hours, says the girl is “an advertising trick,” reports MarketWatch. Early Tuesday morning a bronze statue of a young girl in high tops, face defiant, hands firmly on her hips, was placed in front of the iconic charging bull statue in lower Manhattan’s Bowling Green park. The statue, created by artist Kristen Visbal, was installed by international asset management company State Street Global Advisors (SSGA) to bring attention to the need for more women on corporate boards–and for more female business leaders in general.